It has been over seven years since Janaandolan II. During this period, six different governments have been formed with the same political parties and politicians who were part of the Janaandolan. But when it comes to addressing issues of transitional justice, no progress has been made. This is despite the fact that Nepalis have elected a second Constituent Assembly (CA) to write theconstitution. So, what is the barrier to establishing an effective transitional justice mechanism? Is it so difficult to reach common ground politically? A past ordinance on the Truth and Reconciliation Commission (TRC) was not acceptable to victims and civil society. The constitutional validity of the ordinance was challenged and a Supreme Court verdict came in Madhav Kumar Basnet v The Government of Nepal where the court held the provision of a TRC to be unconstitutional and suggested the formation of a separate commission of inquiry on enforced disappearance of persons. Abiding by the court decision, another ordinance was tabled and discussed heavily, but the fate of that document remains uncertain, as the TRC bill has again been challenged at the Supreme Court on grounds that it provides blanket amnesty and the formation of a panel is unconstitutional. Meanwhile, the Adhikari couple was still on their hunger strike. Politicians repeteadly requested them to end their strike but Nanda Prasad stuck to his fight for justice, which ultimately took his life. So why are political parties still reluctant to address the issue? Every political party, whether it be the Nepali Congress, CPN-UML or UCPN (Maoist), promised to establish a transitional justice mechanism in their election manifesto. All those promises have gone in vain. 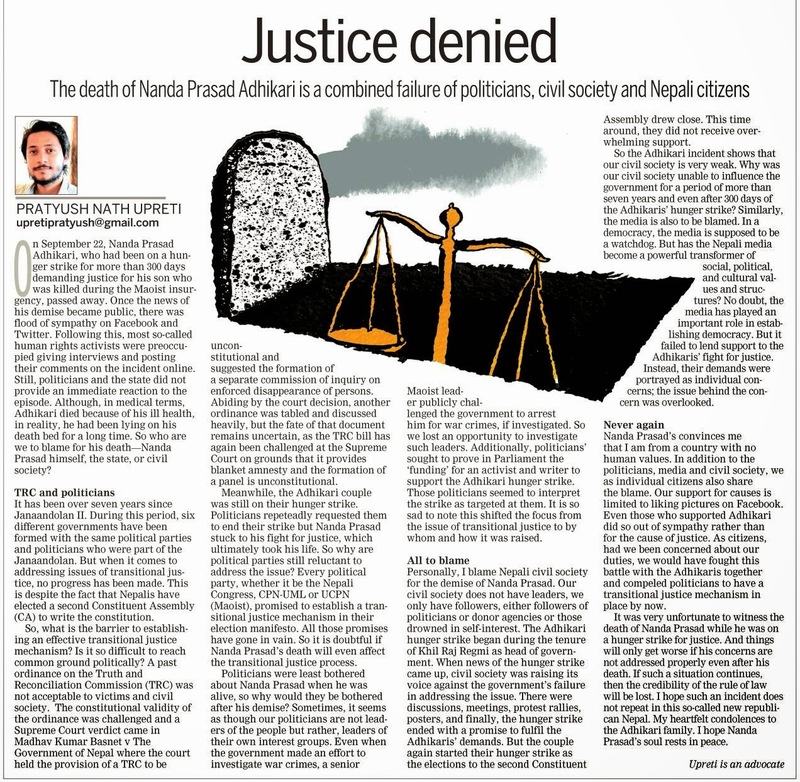 So it is doubtful if Nanda Prasad’s death will even affect the transitional justice process. Politicians were least bothered about Nanda Prasad when he was alive, so why would they be bothered after his demise? Sometimes, it seems as though our politicians are not leaders of the people but rather, leaders of their own interest groups. Even when the government made an effort to investigate war crimes, a senior Maoist leader publicly challenged the government to arrest him for war crimes, if investigated. So we lost an opportunity to investigate such leaders. Additionally, politicians’ sought to prove in Parliament the ‘funding’ for an activist and writer to support the Adhikari hunger strike. Those politicians seemed to interpret the strike as targeted at them. It is so sad to note this shifted the focus from the issue of transitional justice to by whom and how it was raised. Personally, I blame Nepali civil society for the demise of Nanda Prasad. Our civil society does not have leaders, we only have followers, either followers of politicians or donor agencies or those drowned in self-interest. The Adhikari hunger strike began during the tenure of Khil Raj Regmi as head of government. When news of the hunger strike came up, civil society was raising its voice against the government’s failure in addressing the issue. There were discussions, meetings, protest rallies, posters, and finally, the hunger strike ended with a promise to fulfil the Adhikaris’ demands. But the couple again started their hunger strike as the elections to the second Constituent Assembly drew close. This time around, they did not receive overwhelming support. So the Adhikari incident shows that our civil society is very weak. Why was our civil society unable to influence the government for a period of more than seven years and even after 300 days of the Adhikaris’ hunger strike? Similarly, the media is also to be blamed. In a democracy, the media is supposed to be a watchdog. But has the Nepali media become a powerful transformer of social, political, and cultural values and structures? No doubt, the media has played an important role in establishing democracy. But it failed to lend support to the Adhikaris’ fight for justice. Instead, their demands were portrayed as individual concerns; the issue behind the concern was overlooked. It was very unfortunate to witness the death of Nanda Prasad while he was on a hunger strike for justice. And things will only get worse if his concerns are not addressed properly even after his death. If such a situation continues, then the credibility of the rule of law will be lost. I hope such an incident does not repeat in this so-called new republican Nepal. My heartfelt condolences to the Adhikari family. I hope Nanda Prasad’s soul rests in peace.